Disclaimer: As of 2013 no longer use aerosol type sealants and have found alternative methods that I will cover in a future blog post! Thank you! The first thing I loved that I mentioned was it being inexpensive when compared to getting my other favorite sealers. The can of Purity Seal is 400ml, which is roughly 2.2 cans of the MSC($13-$19) and ZMFP($9) cans, and only cost me $17. The Games Workshop where I purchased it from was located in New York City so it also saved on shipping. Another thing that I liked was the labeling being in English. 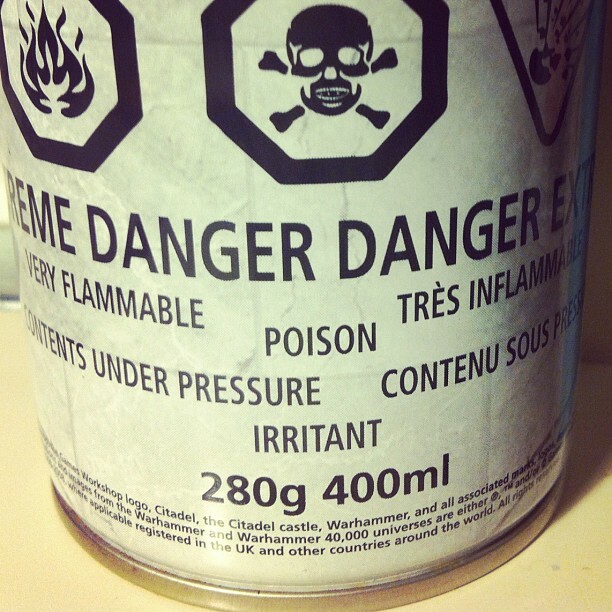 But taking one look at this can gives you immediate anxiety! With Mr. Super Clear or ZM Finishing Powder, the labeling is in Japanese and tiny. Seeing all these warnings really makes you rethink about what you’re dealing with when doing faceups. Rather know than not know though. Always make sure you are taking extra precautions when using sealer! When I began my first coat I was surprised by the power this can sprayed out it’s product. It coated all over pretty fast and pretty hard. I’m not sure, but it seemed like you would have to tape down smaller parts you wanted to coat to prevent them from being blown away. So this was a pro and a con in certain situations. Now, that’s pretty much it with the things that I liked about it. It was pretty true to it’s matte description and did have a lot of tooth, but perhaps it was not optimal for using pastels. One thing I did not like, which is obvious, were the fumes of the sealer being rather strong, stronger than MSC and ZMFP, and it lingered for a lot longer. This does not mean is more or less dangerous than the other sealers! Always use all sealers in a well ventilated area with a respirator and gloves. 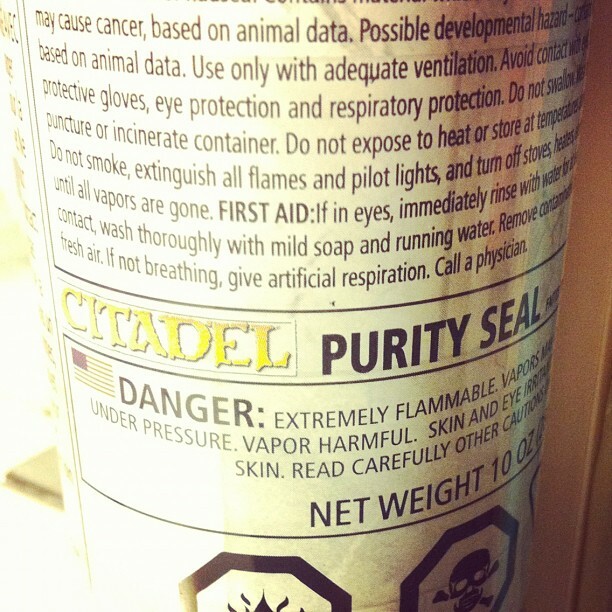 Also, one of the ingredients to the sealer is Acetone. I believe this is used to allow the product to be liquefied and sprayed. It is possible that it is also in MSC and ZMFP, but I am not certain. Acetone is damaging to resin. It may be too little to affect the resin, but I have not been able to do a long term test as of yet. I used the head cap of my own doll to test this sealer. It had a shiny company seal so you could really see how the sealer went on. As you can tell below the before the seal is glossy and clear, and after spraying it is a lot less glossy and has a gritty coating. The texture of the cap after spraying was somewhat velvety and had a powdery residue (this is why you should handle with gloves when working). This was after waiting 30 minutes between each coat. The directions say it is dry after 10-15 mins and ready to paint over after an hour. I cannot compare this information with the other sealers, as their directions are not in English. After waiting the 30 minutes on the last coat I blushed with Rembrandt pastels. The sealer was rather stubborn. It seemed to not want to accept the pigment. I added the normal amount to my brush for blushing red cheeks and added it to the head cap to be met with a lot of blotchy unevenness. That was a big dislike for me. On top of the long wait time for the fumes to disperse, and for the sealer to be ready to work, I’d be faced with slowly layering pastels. Compared to working with the other sealers I had a way easier time with MSC and ZMFP. I personally would not continue to use Purity Seal, but that does not mean it’s not an option when sealing Ball Joint Dolls. 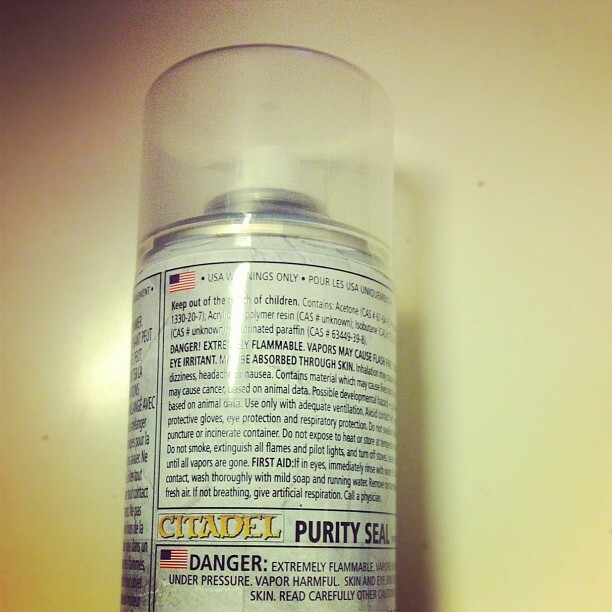 If you liked this review or have any other questions about Citadel Purity Seal leave a comment. You can also write to Games Workshop for questions about their products. Thanks for reading! Really helpful, thanks so much! I'd been looking forward to this review since I spotted that you bought a can through Instagram. I got a can a while ago and found it really hard to work with…but I put it down to my amateur experience with faceups in general due to the positive reviews around DoA. I too found that high quality pastels seemed scratchy and blotchy in areas – it got to the point where I was worried the actual resin was uneven. It's disappointing, but I'm glad that it's not just me that found it difficult to work with. I'm very accustomed to MSC but I've pretty much given up trying to get hold of a can…can you recommend anywhere to buy it? I'm glad it was helpful! I would buy MSC from PlaJapan – http://plajapan.com/product_info.php?products_id=2061 They are usually in stock, but sometimes there is a backorder wait. AFAIK, MSC also contains acetone. 🙂 At the Games Workshop I went to, they told me to spray it differently from how I'd use other sprays– as each brand of sealant has different methods that work best. I was told to spray with extremely short bursts and to keep the can moving the entire time. Navci and I have had really nice results with spraying it at a further distance thank MSC sealant– makes the tooth more fine. It also dries fairly fast for me because I use fine, short-burst coats. Thanks for the review! Always so awesome and interesting to see how other artists are doing things. Thank you for your input! Good to know that it is still an option for sealing BJD's, and you had positive results. the trick is to shake it well before usage, get it at least 12 to 20 inches for the first burst and pass left to right quickly for a first very thin layer. dont try to cover verything. Also watch out for humidity – if its hot and humid outside your varnish will become white and blurry. wait a hour between each layer and put 2-3 layers – remeber thin layers! as you becomme more experienced with it you can get closer to the object but never closer than 10 inches.small burst, thin layers and not too humid – rainy days are a bad idea even from inside a garage. Have fun! Thank you so much for the detailed review! If you ever try this on a MH or EAH faceup, please share the results as its really hard to find details on this product. I love MSC but definitely hoping to find a good replacement that I can easily buy in the US. Thanks again!! Hello Tam! I’m glad you enjoyed the review. I no longer use aerosol sealants for doing face-ups for any kind of doll, as they are very harmful. I use a less toxic option through the use of Vallejo matte varnish, an airbrush, and spray booth. I hope to cover more about it on the blog in the near future, so keep an eye out! I know artist Xhanthi and Andreja have videos about using a similar method on their youtube accounts! So do check them out!